Unveiled at Lord Beaverbrook's Childhood Home June 23, 2017. A new plaque honouring Sir William Maxwell Aitken (Lord Beaverbrook) was unveiled by Parks Canada and the Historic Beaverbrook House Commission on Friday, June 23, 2017 at Aitken’s childhood home in Miramichi. 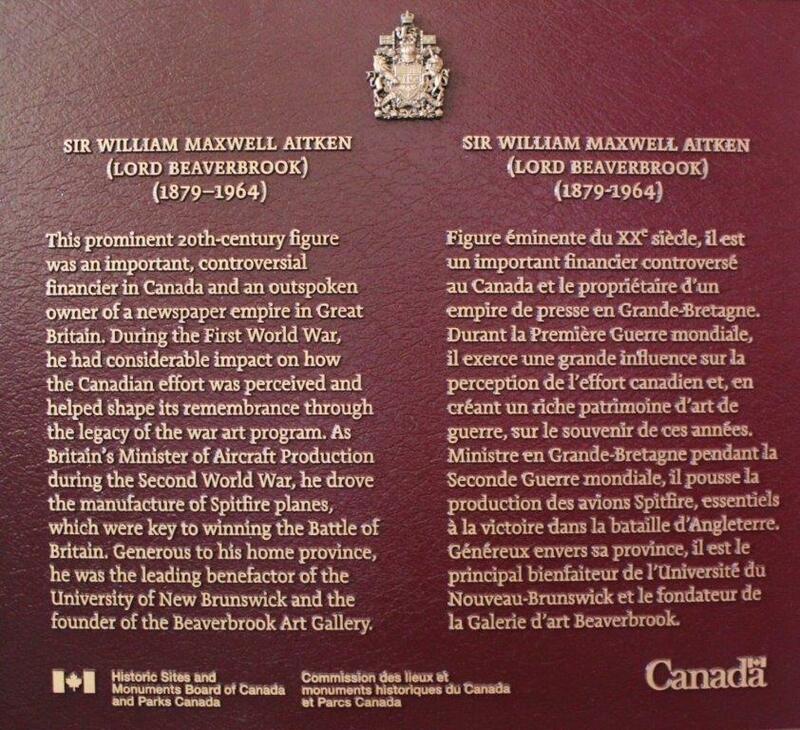 The plaque (pictured above, click to enlarge) comes three years after the National Sites and Monuments Board of Canada announcement declaring Lord Beaverbrook a National Historic Person. With the installation of the plaque, The Historic Beaverbrook House was elevated to a National Historic House. A gallery of the day’s proceedings can be found here. Interested in the history of Lord Beaverbrook? Click Here or drop in for a tour of Lord Beaverbrook’s Childhood Home, located at 518 King George Highway, Miramichi, NB, open Monday to Saturday, 9 AM-5 PM, and Sundays 12 PM-5 PM. This prominent 20th-century figure was an important, controversial financier in Canada and an outspoken owner of a newspaper empire in Great Britain. During the First World War, he had considerable impact on how the Canadian effort was perceived and helped shape its remembrance through the legacy of the war art program. As Britain’s Minister of Aircraft Production during the Second World War, he drove the manufacture of Spitfire planes, which were key to winning the Battle of Britain. Generous to his home province, he was the leading benefactor of the University of New Brunswick and the founder of the Beaverbrook Art Gallery.